Interview with zEleFthAnD by Autothrall. When launching this site six years ago, my original intention was not only to write up critiques on a comprehensive body of metal works, but also to converse with the creators behind some of the most compelling and inspirational of recordings I've encountered through my listening. Well, as the months (and years) rolled on, I really failed to launch on this aspect, finding it difficult to dig up the investment I had in the 90s when writing for a print zine. That all changes this Spring, as I embark on a monthly quest to pick the brains of some of the more fascinating authors of agony in the underground! Who better to start this with than the esoteric consciousness behind the Howls of Ebb, whose debut album through I, Voidhanger records has spent several nights with me on the very precipice of sanity...I was honored to speak with songwriter, vocalist and guitarist Z.L.H.. Z.L.H. : I had the name prior to writing any content. It came to me quite easily because I already had an idea of the sound and approach in mind. 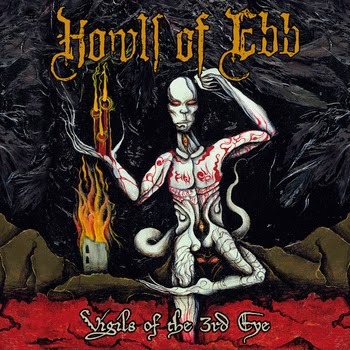 I suppose ‘Howls of Ebb’ could be construed as an (almost) irreconcilable duality of those that are in denial, fearful and/or mournful of humanity's inevitable demise (or decline), and those that embraces it with vigor and might. As the creator, I like to weave through both simultaneously, as a voyeuristic watcher, static, benign, only observing. It’s all very real and directly ties into the concepts and lyrical themes of the music. Though this is the first album for this particular project, you've actually been at this for quite a long time. Could you tell us a little about your earlier band Nepenthe from the 90s? What was it like performing black/death metal in Kansas City so early on, or was there a relatively populated scene? Why'd you call it quits back then? Is its newer incarnation Ligeia a direct continuation? Yes, Nepenthe started in 1992-93. At that time (and I imagine till today) there was no scene in Kansas City. It was just Order From Chaos and a few other folks. We all hung out together, and would occasionally play live for friends and OFC. Nepenthe technically played one live audience show, which was recorded and released as a cassette called ‘Live at Howards’. In ’95, I changed the band name to Ligeia. The two primary reasons for the change were that the sound and style changed considerably, and band members trickled down to just myself, and Chris Overton, which made it more a project than a band. After the 1996 Ligeia release, In Death Overshadow Thee demo, I became pretty bored with metal in general. The second generation BM bands like Emperor, Mayhem, Burzum, Blasphemy, Impaled Nazarene, Samael, Beherit, etc…quickly were being duplicated (and still are now!) In addition to the stale nature of DM, it just all became hugely repetitive and predictable. The inspiration to create music quickly waned and I just moved onto other things that I enjoyed. My desire to write music picked up again around 2006. I've encountered a number of your previous releases on badGod music, specifically Trillion Red and King Carnage. Like Howls of Ebb, both were pretty unusual. Did a lot of that unconsciously influence you when conceiving Howls' sound, or was this a decision to completely flip the script on anything else you'd written? Will this be taking full priority or will there be future Trillion Red material? I think HoB has enough room within its boundaries to keep my creative juices flowing for a long time, so I suspect it will be my only working project for many years, or until I either I get bored with it or feel I nothing left to contribute. If I were a gambling man, I would say there are probably 2 to 3 more significant releases to come. I certainly do not anticipate any distractions or other projects. Moving backwards, Trillion Red was an experimental phase of mine when I learned a lot about production, mixing, effects, processors, and recording. Anything I had available to me, I used. It all ended up quite complicated, and without much of a focus. Later, the urge to create something deadly, stank, and bludgeoning spawned King Carnage. That was a one-off I did for fun, but indeed an excellent record! After I got that ‘urge to kill’ out of me via King Carnage, I thought the ideal candidate for a long term serious project would be a combination of Trillion Red and King Carnage, i.e. something complex, elusive, original, deep, dark, but with a sharp cutting pendulum swinging at all times. How did you meet the other guys in the band, who operate under the handles of Rotten Bliss and Benign Blight? Did they think you were mad when they first heard you jamming some of this material, or did they actually prompt you along this left hand path? Although I always see my own material as nothing out of the unusual, I do think of it as original. I do hear or read a lot of people saying HoB is “strange”, “weird”, “experimental” or “crazy”, but I think in this particular case, these are typical words to use when hearing something original, but not actually fully realizing it yet. As for mates in the band, B.B. is a long time friend I have known for over 20 years. We share the same tastes in music and have written together in the past, so there were no surprises. On a side note, he happens to write way more bizarre stuff than I do. R.B. is a freak among the most gentle of trolls. He probably has the most diverse taste and skill set I have come across, and a young lad too! For the most part, I don’t think anything I showed him was a surprise, and that is why I liked him so much. He just takes what I have and runs with it. A lot of what we create is pretty symbiotic. It all starts with seeds and ideas I pull out of the old pocket, and then we break it down, expand it, and put the proverbial puzzle pieces together as a group. When did you cross paths with Luciano and I, Voidhanger records? Was it through a shared love of Darkthrone's Plaguewielder, or did you demo the material to a bunch of labels? How about sharing a roster with other killer bands like The Wakedead Gathering, Ysengrin, Spectral Lore and Bloodway, did that tip the scales? No shared love of Darkthrone here. We actually began talking after I purchased some records from him, as well as traded the King Carnage for albums he released, like the Ysengrin, Ævangelist, Seperent Asecending. I mentioned HoB and showed him a song. He loved it and I also hold his label in very high regards, so it just made sense to work together. It's probably contrived to describe Howls as a 'deconstruction' of death metal aesthetics, but can you actually explain what inspired your decision to tackle this from such a loose, organic and extraordinary perspective? The musical objective I had (and still carry forth) when writing Vigils of the 3rd Eye was to have loosely defined limits and boundaries, but strictly stay within them. A lot of that is simply a ‘sense’ that comes from years of playing, a decent ear, and a bit of grey hair wisdom. Secondly, it is to create a very dark, deep and heavy morbidity. There wasn’t any midi or digital music going on in the instrumentation and recordings, just guitars, vocals, drums and bass (and that isn’t because of some sound or production ideology we hold). Within the structures we create, we give everything enough breathing room for ebb and flow and to tell as story. That leaves a degree of room for experimentation, and even some improvisational material as well. I coin the HoB sound/style as ‘Limbonic Hymnals’. And surely, there will be more to come. Vigils was entirely self-recorded and produced, and then sent off to master. Can you reveal a little about the setup, I'm curious how you arrived at some a natural but uncanny sound? The recording / rehearsal studio was put together over the last 6 years. A pretty penny went into all of it, but certainly worth it, as we are able to create a decent sound without the limits of time. As for the setup, I’ll skip the gear-head talk and just say it all consists of solid fundamentals: a properly treated recording area, good microphones, a great board, and outboard compressors/processors etc…Beyond that, it is just a matter of getting high quality source recordings so that the mixing process is as simple as can possibly be. Is there a lot of studio improvisation in there, or are all those subtle, bizarre effects and details plotted in advance? Actually, there is some improvisation captured in the recording. If it sounds good and wasn’t intended, we will surely use it. That often is the best source material. I enjoyed reading through the album nearly as much as listening to it. Would you say the lyrics of Vigils of the 3rd Eye are uniformly, thematically linked, or disparate in meaning? 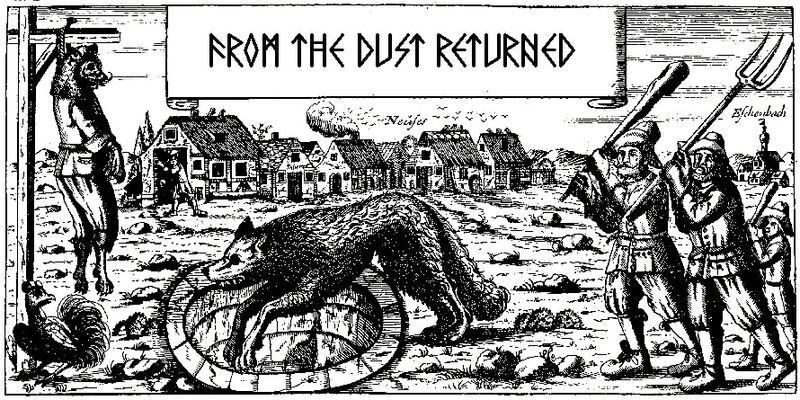 I noticed an occult thread throughout, but are there any particular works of fiction or philosophy that influenced you directly or indirectly? Perhaps some horror? Many of the lyrics were originally written as short poems over a course of two years. A lot of it was harnessed into lyrical form to fit the structure and cadence of each individual song. There is a loose thread all throughout. No occult content or philosophical derivatives were involved, but perhaps I could say ‘poetic justice’ of a sort. ‘Martian Terrors, Limbonic Steps’ is a first hand account of our coming demise. ‘Of Heel, Cyst and Lung’ is a personal mystic journey in the 4th dimension. ‘Opulent Ghouls, Blessed be Thy End’ is what happens when an Observer oversteps his bounds and directs death upon undesirables. Then we have the song ‘Vigils of the 3rd Eye’. This lyric and 'Illucid Illuminati’s' really are the fundamental thread that weaves throughout the entire album. In ‘Vigils’, The Grand Voyeurs are ever-watching and observing the decay of societies, cultures and civilization. Such observations are only seen with a keen and clear eye; e.g. Illusions of pop and underground culture are largely silly inbred and regurgitated ideas that either serves as red herrings in thought and action, or as catalysts to quasi-solutions that only produce more harm. Humanity lacks the will and path to save itself. Those that try to save it are usually apart of the problem. It is here that we must accept mankind’s inability to see its underline failures and faults, and understand that it will soon come to an end. Only few will embrace it with open arms, and importantly, not to meddle in it, only observe. Conceptual themes for the 2nd album won’t be dealing with just tangible ends, but deal with more elusive, abstract, and dark ideals and spiritualities I have surmised over the last 25 years. I expect the new batch of material to have a much stronger contextual linearity. Wiley Trieff's artwork for 'Vigils' is outstanding, some of the best I've seen this year. All the panels burn themselves into your mind and won't seem to leave. Was there are a lot of input from you on the booklet images, or did you just let him run with the lyrics and concepts? Actually no. These were paintings Luciano had in his back pocket, waiting to use for just the right release. It is indeed one of the best layouts I have ever laid eyes on, as it is a perfect merriment of sound, lyrics, and art. Quite the experience! San Francisco has had a long, eclectic history across a number of metal sub-genres, like the Bay Area thrash in the 80s or the USBM stuff more recently. Have you ever socialized with others in the scene, or do you actively record any of them? There are some really great modern bands here in the SF area! It has quite a vibrant and innovative dark artistic scene now. However, I rarely go to see live performances, so it doesn’t lend a lot of opportunities to meet other artists and forge ties. All 3 of us have other significant obligations that keep us at bay! Hah! I can barely sneak in a good midnight sacrifice these days. It’s a damn shame. Any live shows on the horizon? Are there any particular acts you feel would complement you on tour if given a choice? Or that you'd love to support? I almost find it difficult to imagine you playing alongside more conventional death or black metal acts. We have been discussing the idea of playing a few shows, but any kind of tour would be out of the question. 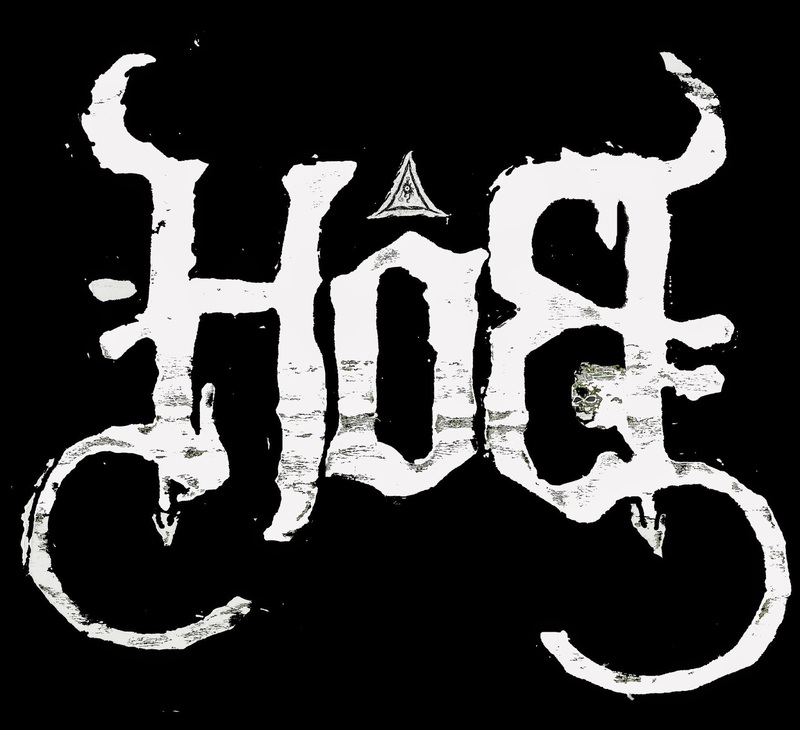 HoB would really require another guitarist to get the full effect live, and of course, time away from work. Its all entirely possible, but we aren’t really being entirely proactive in making such a thing come to fruition. As for acts to share a stage with, I can certainly think of several: Murmur, Morbus Chron, Sonne Adam, Negative Plane, Sol Negros, or Irkallian Oracle would be great bands to share an evening live. Awesome record, sir! Thanks so much for bringing out that creativity and leaving such an impression. I realize it's but a couple months old, but when might we expect a sequel?!! Thank you! We are currently smack in the middle of writing a 20 minute’ish piece for the second Chapter of I, Voidhangers Yogsothery compilation. That should see the light of day in 2015. Right after that we will begin writing the follow-up album. Assuming our flow continues unabated, I would expect to see a full-length release maybe in late 2015, or early 2016. Tough to say, but I would like to keep up the momentum; however, quality governs! Check out Howls of Ebb on Facebook. Hear and/or purchase Vigils of the 3rd Eye through Bandcamp.